All three of these tools can combine to create a synergistic effect for the local brick-and-mortar business and take your location from obscurity to one of the most relevant and highly focused, lead generation machines, directing people like the pied piper right to your front door! The purpose of this site is to show you exactly what you need to do for each of these three major components mentioned above. When it comes to local search results, this is how you fully optimize the three in such a way that build upon each other. This will begin to drive massive amounts of traffic as well as interested people right into your business and marketing funnel. Here’s how. Before we directly delve into some of the best ways to optimize your entire Google local profile information which includes Google Maps (i.e. Google +, Google My Business etc. ), we are going to work a little bit backwards because intuitively this is what makes sense to most business owners when they are trying to optimize their Google maps listing. 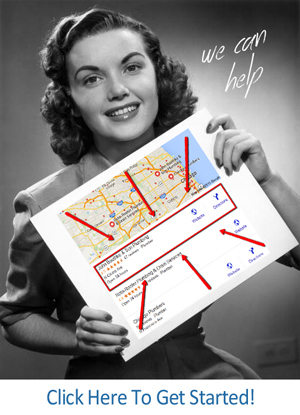 It is important that you understand that optimizing your local profile across Google is what matters for your Google local map location to begin to appear in searches. Google maps are contingent on other Google tools. Once you understand how important it is to make sure all of your information is similar across several of Google’s local marketing tools, everything will fall into place correctly, and you will be able to optimize everything across Google’s networks seamlessly. In each section we will discuss the exact steps necessary to do everything that we are about to list for you. So don’t get too excited, or overly concerned. Optimizing Google starts with one page, one location and one step at a time. When you combine all of these factors together everything works inherently to assist your business to reach as many people as possible. Claim and optimize your Google My Business listing as explained in that section. Create and establish a congruency between all profile pages with the same name, address and phone number information (NAP) by using citations as explained in the last section of this e-book and this is easy to accomplish if you do it daily. Creating and maintaining actual REAL reviews from customers and clients located across the area of service that you are going to be providing. Following all of the best practices of Google as well as providing the correct and accurate information for listings and citations. Utilize pictures and videos connecting with your business to further provide credibility, good content to your industry and drive interest as well as clicks and conversions to your business. If you read and apply all of the information in this guide, you will be performing all of these tasks, both individually on the Google listings, as well as generating the correct number of citations to both manage and maintain high search engine visibility. Everything you see above in this diagram works together to help your business rank locally. In order to optimize Google Maps, Google My Business and Google +, everything will work best when you integrate it all at the same time. one stop shopping for local rankings. The more you cooperate with Google, the bigger the rewards are. We will review how to do all of this in each section in the guide and if you just devote 1 hour a day to this process you can rank with the top people in your industry.